So today I decided to replace my gamepad screen, since my old one had a scratch that make a area of the screen untouchable. Seems while in the process one of the ribbon clamps came off. I found it, but while trying to put it back on it snapped in half. it looks like this one. Anyone know if (and where) I can find a replacement, or a way to make it work? Everything works fine except for touch, which is what this cable is for. I hear electrical tape can work, but I don't know what exactly to do with that. Position the ribbon cable onto the conector and then use white tak...its like blue tak but kind of sets harder!...to keep the cable pressed down. This worked for my one! You might have to try a couple of times before you get it to work! Would love to see this youtube video. I just tried and got nothing :/ Is the ribbon supposed to lay on top of the connector, or under? It slips in under so i figured thats the right way to do it. Just doing my vid today... i'll post on YouTube tomorrow and I posted the link asap. 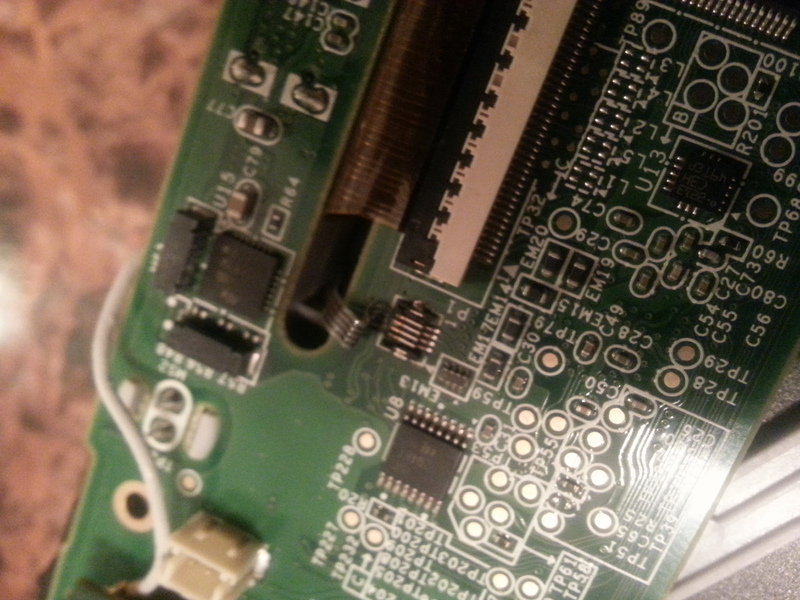 The ribbon cable socket is desoldered from the logic board. It can be soldered in place but this have to be done by a pro. Find a place that repair iPhones and ask them to do the job. Isn't the socket what the ribbon cable goes into? I'm just talking about the gray thing that clamps down on it, unless that's what you're talking about. OK, doublechecking at the first pict I think that it's the cable that need to be replaced. The connector is desoldered from the cable and seat now in the socket. Not sure that the connector can be soldered to the cable. Looks more like the grey clasp is broken off. It provides downward pressure on the cable and allows it to make contact. oldturkey, is it the same type of socket than the keyboard backlight socket on a MBP ? You insert the cable in it and push down a lever to secure the cable ? The cable's fine, the angle just makes it look weird. I am talking about the gray part that clamps down for pressure. I need this answer too. Chrisall76 did you ever get something to work? Nope, had to buy a new gamepad.